There was a long weekend coming and one of my friends suggested to go on a road trip. Though we had many suggestions earlier for road trips, all were limited to planing stage. So we decided it is better to plan a small road trip with more time allocated to sightseeing than driving. “Ella” won most of our votes. There were only six people confirmed participation (Including me) and two cars were more than enough. To make that more of a road trip, we decided to go to Nuwara Eliya on the first day and then drive to Ella and spend the night there. Our initial plan was to camp at Ella rock but we found out that it is not allowed to camp there now as someone has set fire (may be mistakenly but it is totally irresponsible) in recent past. We were angry with the people who are responsible to the fire for ruining a another best camping location for Sri Lankans. So we had to search for accommodation and found a decent place in Ella town for reasonable price. We spend the night of the previous day at a friend’s house. We started our drive around 9 am from Pilimathalawa by two cars. We had breakfast in Gampola town and took our time driving up to the misty hills of Nuwaraeliya. All four of the usual partners for bicycle rides (Read more about our bicycle rides from Nuwara Eliya to Kandy and Pattipola to Kandy) were there, so we took a break to have a good cup of tea at our favorite spot. A hot cup of tea combined with a piece of chocolate cake from Macwoods Labukellie tea Centre was the ideal combination for the misty and cold weather. It took around another half an hour to take a group photo and hang around the observation deck. Next we drove up to NuwaraEliya town. It was just around noon and we were not hungry. So we went to the park next to the Lake Gregory and enjoyed the warm sun rays filtering through the misty clouds. It was a long weekend and the park was fairly crowded. Children were in line to take a ride on a Pony while a bit older crowd were focusing on a Zip line across the park. After spending sometime lying on the ground we thought of checking out the kayaks that were for rent. It was 500 LKR per kayak for 45 minutes. We rented three kayaks and teamed up to balance the weight! 😀 We had to be seated when they pushed the kayaks to water from a feet height lake bank. We were bit worried about the balance and splash of water, but they managed to put our kayaks to water safely. It was easier than it looked. We got used to the kayaks and rowed them to the other corner of Lake Gregory. We were busy with taking photographs and suddenly realized that the lake surface is empty and we were the only people in the middle of the water. Then a sharp whistling noise pointed us to the sky. A seaplane was about to land on us!!! So we used the full strength and rowed our kayaks to the closest river bank. The plane landed afterwards giving us better opportunities to take more photos. We decided to head back to the land to have the lunch. We searched for restaurant suggestions in the internet and went straight to “Salmiya” restaurent but they had many orders waiting so we decided to look for something else as we were extremely hungry. Our next stop was “Calamander Lake Gregory”. We ordered soon and enjoyed our food for more than an hour before starting the journey up to Ella. We reached Ella around 5 pm and took some time to rest after the long drive. It was drizzling and the whole world was covered in freezing cold mist when we looked outside. We had no choice but to go out for Dinner. We went straight to Cafe Chill as we were there before and it was popular for their tasty dishes. It was 30th of December and they had a DJ organized. So we thought to go there and asked the staff about it. Sadly the waiter informed that they have limited it only for foreigners due to some issues occurred sometime before. It was a big slap for Locals but we had to accept the fact that the owners made the decision in favor of their industry and the good name of Sri Lanka. So we went straight back to the place we booked and went to bed early with the hopes of starting the Ella rock Journey early in the morning. It was around 4 am when i woke up by the alarm. 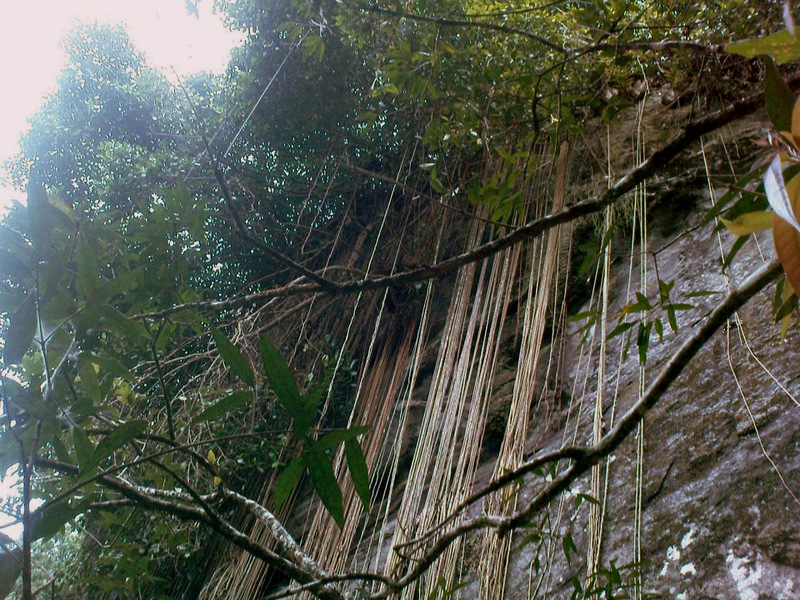 We hurried in to our hiking clothes and went toward the Ella rock road by a car. 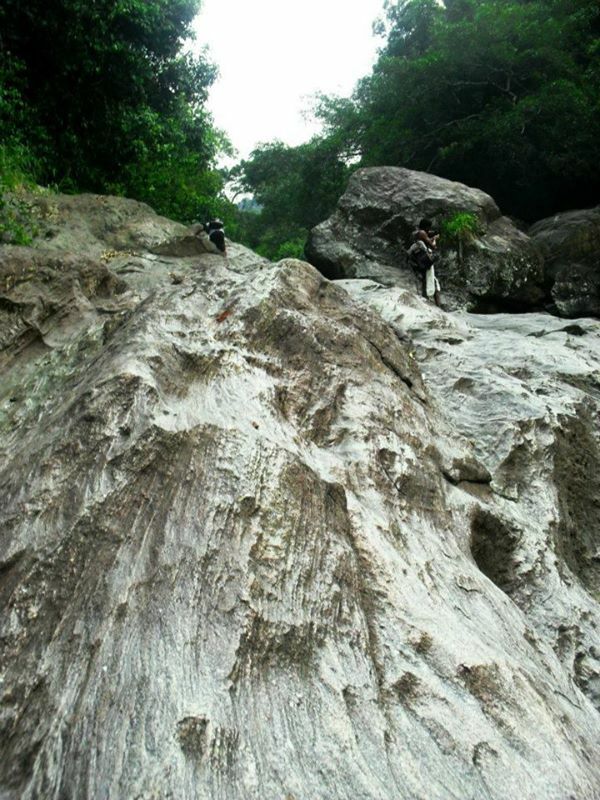 We were said that the by road to Ella rock is on the left hand, so we decided to use google maps to find the location. It took only 30 minutes to reach the google map location but we couldn’t find any junction. So we decided to seek help from a villager. But we couldn’t find anyone as it was too early. Then a Threwheeler came towards us and we asked them about the directions. They directed us towards a junction on the road we came and when we went, there wasn’t any by road. So we searched on our own for around 30 minutes and found out that the people who we asked for directions had mislead us, The by road was just few meters ahead of the place where we met them! That was one of the worst experiences I have ever had. 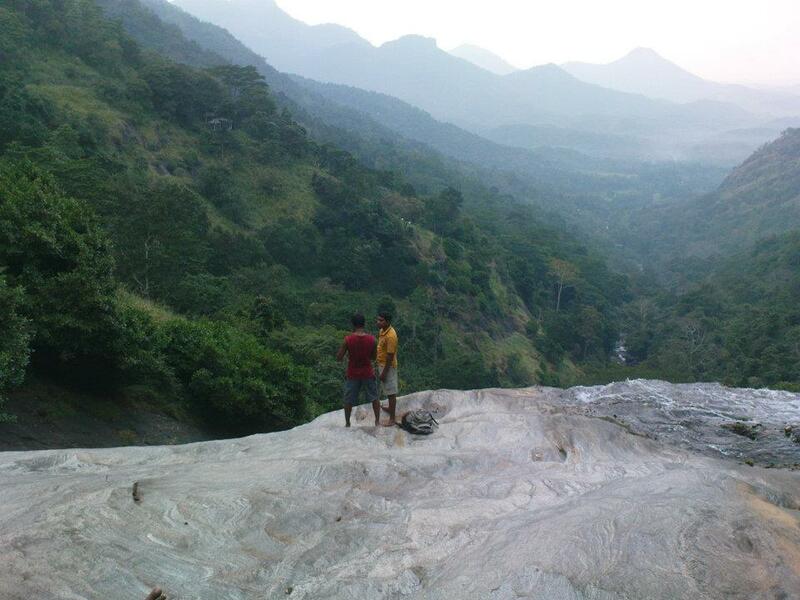 We drove on that road and came to a dead end near the Kithal-Ella Railway station. The final part of the road is not in a good condition but our car managed to do some Off road-ing. We parked it near by and went down on a foot path to the railway station. There was a villager feeding his cow nearby and he kindly lead us towards the trail to Ella rock. You have to walk on the rail track for few meters from Kithal-Ella railway station until the 166.25 sign post and take a left turn to the foot steps towards the small tea plantation. Few steps after we found a a small bridge over a crystal clear water stream but sadly the Sun came out at the exact same time. We had high hopes to capture the rising sun from Ella rock, as we heard that is a marvelous experience. But with the delay to finding the correct by road, we missed that. There was a small shop (like thing) adjacent to a clay (wattle and daub) house. We decided to have a break there as we are already late. There were biscuits so we bought a packet and had some plain tea. She was looking after three small kids (her grand children) while their parents are working somewhere, Faces of those kids gave us a clear idea about the hardship of life that they are facing. Old lady confirmed our trail is correct and gave us some tips stay on the main trail without wandering to one of many foot paths there. There was few dogs and one decided to climb the rock with us. The climb was less intense for most of the part and we met few groups of foreigners on the way. Gigantic umbrella of trees filtered the warm sun rays and unveiled the beautiful sky from time to time. It was a wonderful experience and we could imagine how it will be at the sun rise. After about 45 minutes of climbing we reached to a plane, Which could have been an excellent camping location. Just after that the climb began, it isn’t the hardest but comparatively the way up to that point is much easier. We took many breaks to catch our breath and capture many photos as we could. We met a couple and few groups of foreigners each after a dog guiding them to the top! 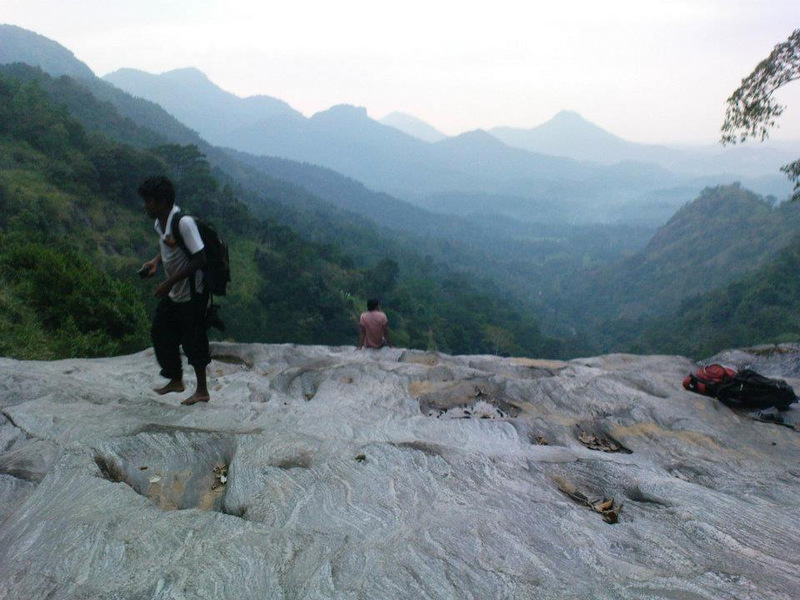 There are two path from the top, one towards Rawana Ella and the other just leading to the Ella town side. We spent around an hour there under the thick shade of the pine trees before starting the journey back to Ella town. We went straight back to the place we spend the night and packed the bags. Then went to the same cafe we had the dinner last night and had a long satisfying lunch. It was around 2 pm when we finished and decided to drive back home. 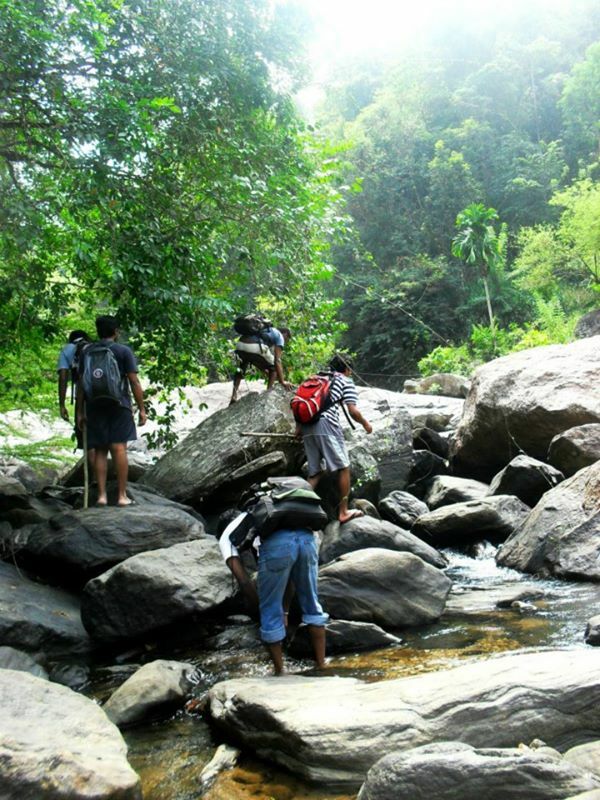 We reached Mahiyanganaya around 5pm and I had left to Ampara for work while others going to Kandy. We had early plans to visit a place called Nil Diya Pokuna, which is an underground pond in a cave near Ella, Sri Lanka. After many considerations we fixed a date in the last week of December, 2016. I browsed about “Nil Diya Pokuna” but information available was very little. 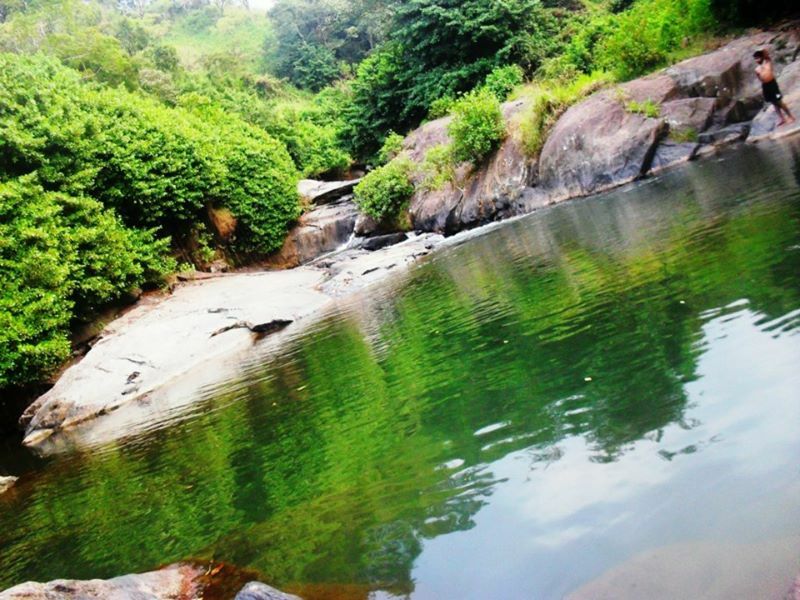 It is said to be a pond inside a cave or a tunnel complex built by king Rawana and most of it is still unexplored. 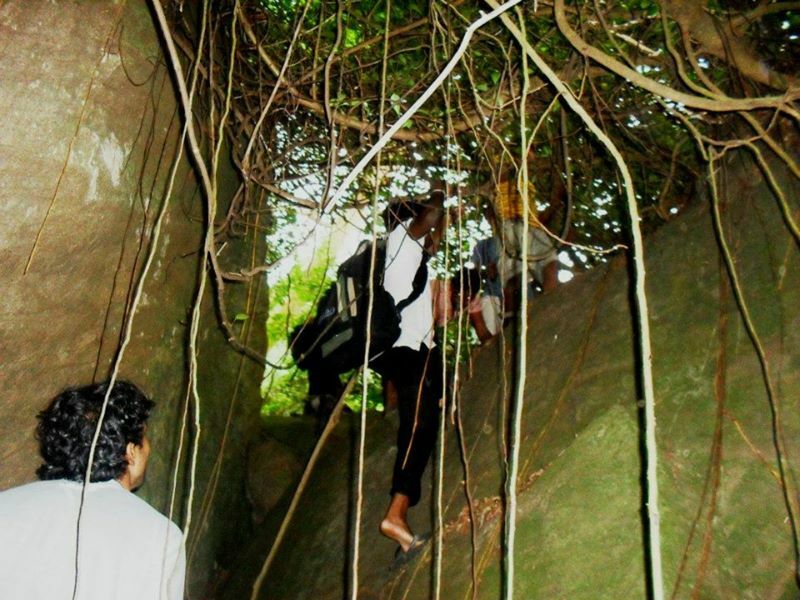 Many people have mistakenly visited the place marked as the “Rawana Cave” in Google maps thinking it is the location of Nil Diya Pokuna, but it is just a very small cave compared to this. Even villagers tend not to give clear directions to this place because of the recent attempts to grab media attention by some people claiming they have special powers and going to awake the king Rawana back! Whether this is built by king Rawana or another human or created due to natural causes is still to be discovered. Until then keeping this intact is our responsibility. Karandagolle Sugatharansi Thero of Karandagolla Temple and “Meththananda” (0726 108 392) are few of the people who knows the place really well. Participants for this journey came from all over the country, so many chose the famous transportation medium Colombo – Badulla Train. But me and another two of my friends had some other plans so we used a car. Two of my friends Started their journey from Kandy around 4 pm and it was about 6.30 pm when i joined them from Mahiyanganaya. One of my friends had reserved a home-stay called “Tree Cold Resort” and it was around 8 pm when we reached Ella. We made a call and asked the Owner of the place for dinner on our way and he arranged a delicious meal within 30 minutes. After having dinner we had a little chat with the home-stay owner. 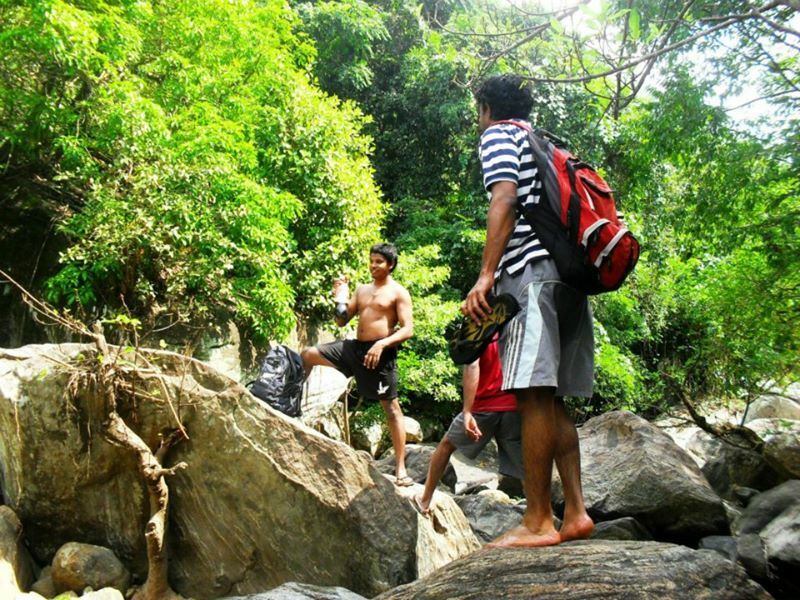 He told us that he is going to Ella rock early in the morning with two foreigners and we could join with them. But we were not sure about our next day waking time, so we kindly declined the invitation. The place was good comparing to the price and we all went to sleep early as we were bit tired. We woke up around 6 am (earlier than we expected) after a good night sleep. We spent some time just breathing in cool fresh air while enjoying the surrounding. Then we changed and had a heavy breakfast (which was delicious) and tried to figure out the day’s plan. As Ella Rock hike will take more than 5 hours we had not to consider it. So we went to Demodara to see the famous Railway loop first. Vehicles can access the Demodara Railway station and have to walk along the railway for around 1 km from there. You have to be very cautious as the railway is bendy, that one can’t see an on coming train until the last minute. It is mentioned that the railway is initially planned as a 11 km stretch to overcome the large elevation barrier, but Late Eng. D.J Wimalasurendra (Who was a Civil Engineer and considered as the Father of Hydro Electricity in Sri Lanka) redesigned this as a loop reducing the length to 3 km. Next we went to Demodara Tea Factory for a Visit. They Charge you 250 LKR per head for a factory visit. It was very informative, but sadly they don’t allow to take photographs inside the factory. There was this old majestic writing table. As it was about 12 noon, we thought of having lunch before visiting the famous Nine Arches Bridge. So we went back to Ella town and had our lunch in “Cafe Chill”. We felt like we were in a foreign country as we were the only Sri Lankan customers there. Food was good and we enjoyed it very much. There are two ways to reach nine arches bridge. You can use a vehicle to reach there via road or you can walk along the rail road from Demodara Railway loop. We chose the main road as we had to come back all the way to Demodara for our car, if we walked along the rail road. You can easily access there by a tuk tuk and can reach almost there by a car. (Last part of the road was under maintenance at the time we went, so we walked the rest of the distance). Nine arches bridge was constructed without using of Steel and concrete and it is wonderful how it bare the weight of a moving train. We spent some time there taking photographs but weren’t lucky enough to capture a train crossing the bridge. Rest of our friends supposed to reach Ella around 3.30 pm so we decided to have a snack until they come. We went to a place called “Ella Flower Garden Resort” just near the start of Mini Adam’s Peak trail and had some snacks and coffee. 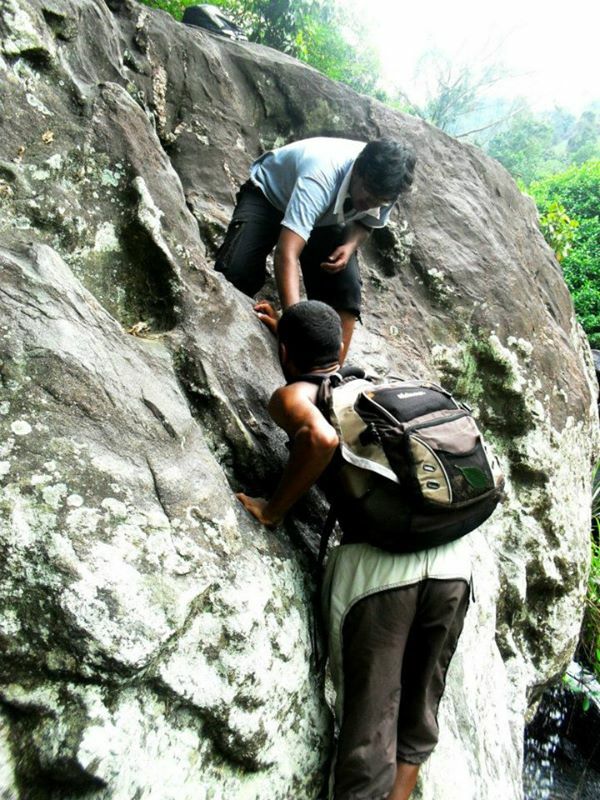 Our friends reached there around 4.15 pm, and we started to climb the “Mini Adam’s Peak”. It wasn’t steep like the “Adam’s Peak” trail and we reached to the peak within 45 minutes. There are many peaks after the initial peak, So we decided to go to them as well. 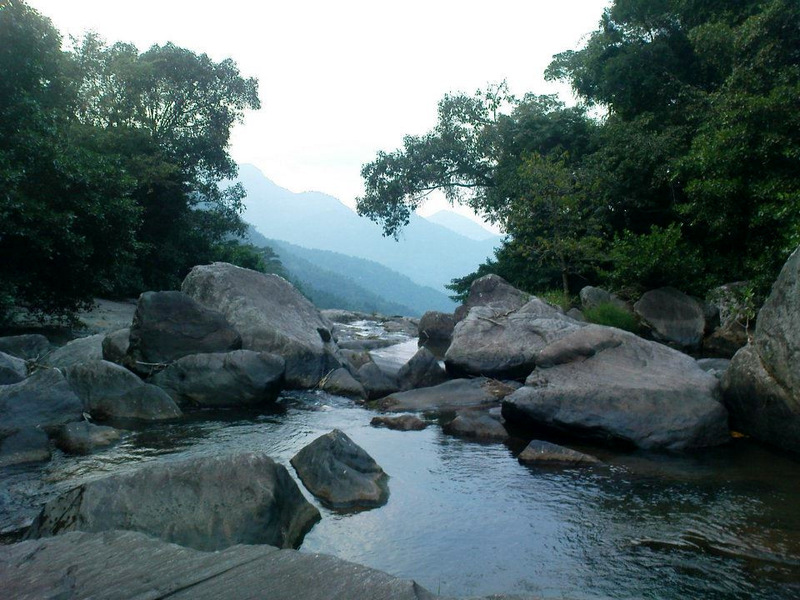 we spent some quality time there with the views of Ella rock and Ella – Wellawaya Highway. Wind was high and surrounding misty mountains created a magical scenery. It was around 6.30 pm when we came back to Ella. Four of us stayed behind to buy dinner for the whole group and the rest hurried up to the bus stand to catch the last bus to “Karandagolla”. As it was a busy day, we had to wait until 8 pm to buy dinner and it was around 8.30 pm when we reached the 16th km post in Ella – Wellawaya highway by the car. One of my friends contacted “Meththananda” (0726 108 392) , The guide for our underground journey well before, so he had arranged us a place to spend the night in his home. All were tired and rushed to take a shower and there was a queue for the washrooms! We had our dinner as soon after we all took shower and went to sleep with the excitement for the next morning journey. I woke up around 7 am and all others were awake then. We took our turns in the wash rooms like the last night and “Meththananda”‘s wife prepared us a delicious breakfast. One of our team members from Monaragala arrived then by his car. Meththananda lead us to a by road and we parked our cars in a place he suggested. We started our hike around 9 am. It was roughly about one kilometer trail from the place we parked our vehicles. We knew the hardships on our way, so we were well prepared. Every one of us had high intensity head lamps (150 Lumens and 250 Lumens) with extra batteries, Torches, Professional climbing rope, Face masks and two life jackets! Meththananda said that we are not going to use the common entrance to the cave and going through the newly found entrance via a place called “Hulan Kapolla”. It only took few seconds to realize why it is called “Hulan Kapolla” after we reached the place. It was a tiny hole (approximately 2.5 feet diameter) in the earth and our eyes were blinded by the dust particles in the wind coming out of it. Our guide tied a rope around a tree lied on the ground near the “Hulan Kapolla” and he disappeared in to the hole, keeping his other two guide friends with us. We had to use the rope to get down from the two initial stages and the guides helped us by pointing up the places they use to set foot down the hole. There was space only enough to glide ourselves down through the hole in the first stage. 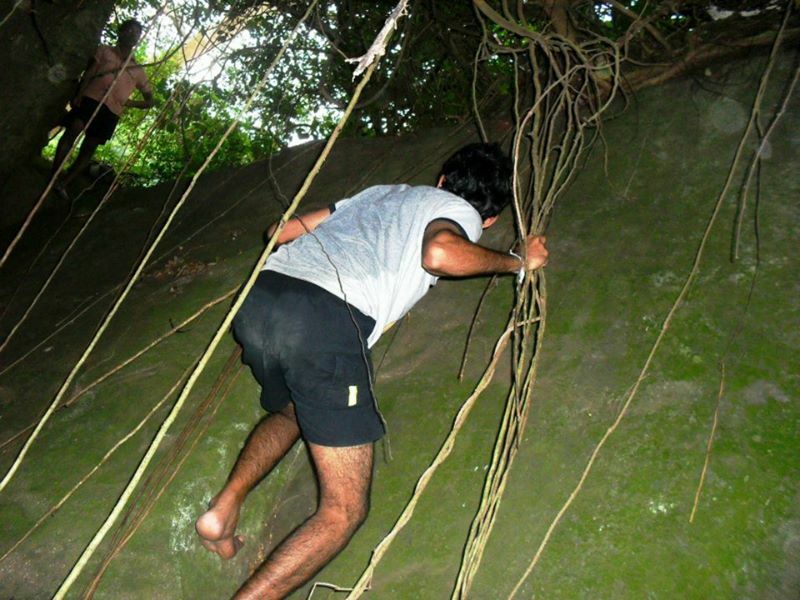 Next there was another hole which was wider and had to use rope plus a wooden ladder placed by Meththananda. We were glad about our high intensity head lamps as they were serving really well in the thick black tunnel. After the second stage there was a steep rocky edge to climb down. 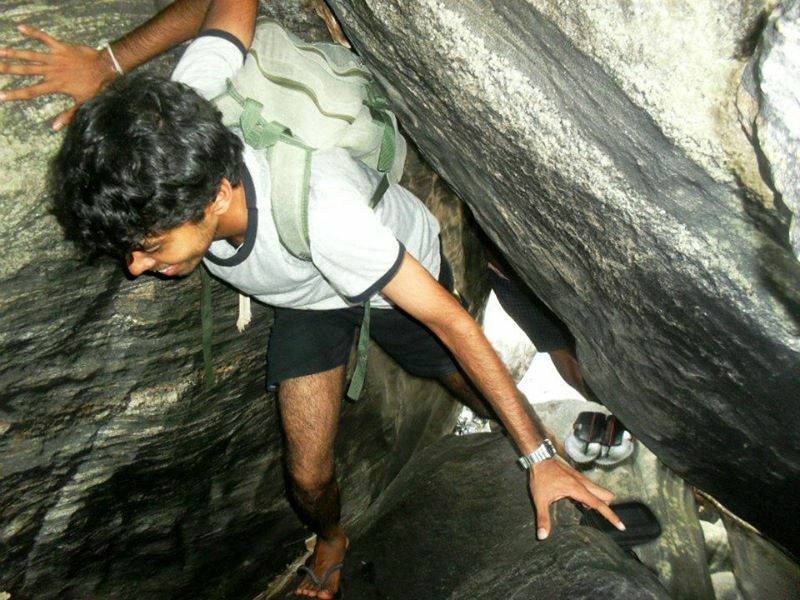 After few minutes of sliding and crawling we entered to a large cave with more than 20 feet height and width (It is definitely more than 20 feet, exact dimensions were kept hidden under the blankets of darkness) . There were few places we had to crawl but generally there was enough space even to play a cricket match! We were enchanted by the views and the size of the cave and walked forward on the rocky and muddy floor. There were few places where my legs went about a foot deep in the soft soil. Walls were with very sharp texture, and we had many bruises just by touching them. Few hundred meters after the floor became steep again. There wasn’t a wall on our left side and all we could see was an endless darkness below. I was in the middle of the group and suddenly my head lamp reflected on something blue. As we knew there must be a “Nil Diya Pokuna”(meaning Blue Water Pond), I stopped and observed again. Yes! It was crystal clear water which had a bluish touch when reflect. We all hurried down on the rocky floor and stopped just before the pond in an awe of the scenery. Water was cold and calm. There was no visual movement at all unless we made ripples just to reflect the light in order to take photographs. For the first few feet we could see the bottom of the pond, but after that there was only an endless darkness though the water was crystal clear. It is said that the water is drinkable, so we had a sip and we are still okay! As we were prepared to swim in the pond, we switched to our swimwear and put on life jackets. We only took two life jackets so we had to take turns. One of us tied the rope in to a rock and put the other end in the water, just in case we needed it. We swam to the opposite end of the pond (the deeper side) with our goggles and head lamps on, but still couldn’t able to see anything below the water surface. That end had an inclined wall which ended below the water surface, which made creepy sounds when ripples collided against it. Most of our group members were regular swimmers (except a few who can’t swim at all) but all had this strange uncertain feeling about the pond, so we were careful not to do anything stupid and risk our lives. It is suspected that there is an entrance to another cave under water but still haven’t confirmed. As the water is clear, once we aim a torch at the water surface it doesn’t reflect (we had to create ripples even to take photographs). But when we have an open light source or when we aim the torch at the walls / roof of the pond it creates a perfect reflection on the water surface. Most of the people mistake this reflection as the bottom of the pond (Which seems somewhat shallow), but definitely it is deeper than 40 feet in some parts (Some say its 80 feet, but no one has officially reached the bottom). As water is cold and using extra energy to be cautious, Two of the team mates had cramps in their legs. Therefore be careful if you are swimming in “Nil Diya Pokuna”and it is advised always to wear life jackets (We bought life jackets from Pettah for about 1500 LKR each and they served well). After spending about one and half hours in the pond, we changed back and started our journey to so called “Rooms” like formation in the cave. We had to use the same path as we came in for a certain distance and then take a detour to a side which was on the dark end of the cave. 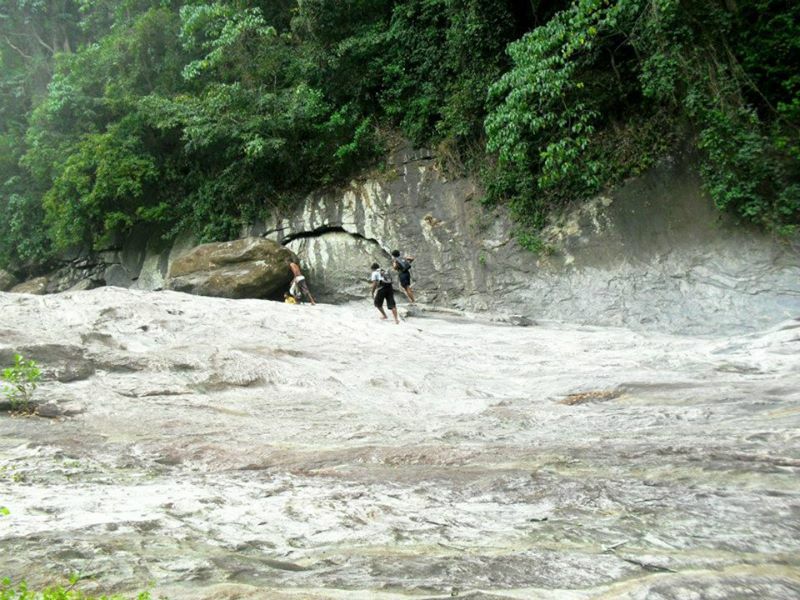 For the first few meters it was hard to walk on the slippery and sharp rock floor, but had enough space to walk. But then we came in to a part where all we can see was a small wedge like space between a large rock plates. It was scary as someone could get stuck in the middle! Then it again opened to a small path which we could crawl. I was relieved but it only remained for few minutes as we reached a place where, literally there is no place to set foot. It was kind of a fallen rock over the cliff we were crawling on, so one had to stretch the legs while hanging on to a tiny sharp edge on the wall to reach the other end or to rely on their fate and make a step on the fallen rock which was slippery and the only thing we could see above the endless darkness beneath us. Five of the team decided to stay there (including me) and the rest of the (thin) fellows continued crawling. We went few steps back to a place with enough space to stand up and decided to observe the surrounding. We observed a small amount of graphite in soft spots of the cave wall. Mineral deposits were also observed in some places of the cave roof. That was the moment we had to actually use the masks we brought due to the infinite number of insects attracted to our head lamps. So we turned the head lamps in to kind of a sleep mode, which had a red LED. After getting rid of that insects, we decided to have a little rest until others arrive. We had to wait about an hour before we could hear their voices from far far away and another 10 minutes before see the light from their head lamps through the rocky barrier. They described what was there while catching their breath. They had to crawl for around half an hour and pass another slippery obstacle to reach the “room” like formations. They have observed limestone formations. Some of them were with sharp edges. The mysterious part is there was a passage further and even “Meththananda” claims he haven’t explored it up to now. Then we started our journey back to surface of the earth and it was harder than descending. Each step was risky as there were nothing to stop us if we were falling. We had to give our total body weight to the arms at the last part, where we had to climb back on the rope. We were so glad that everyone came back safely and our cameras, head lamps, Life jackets, ropes & masks. Then only we realized that our cloths were totally covered in mud and our cameras were brown in color! We took 10 minutes to catch our breath and walked back to the place where we parked our vehicles with a huge satisfaction in mind. We decided to clean ourselves before getting in to the vehicles after eating jambu, which “Meththananda”‘s friend provided. Suddenly three Buddhist Monks and few lads arrived there and they wanted to talk to our guide, Meththananda. 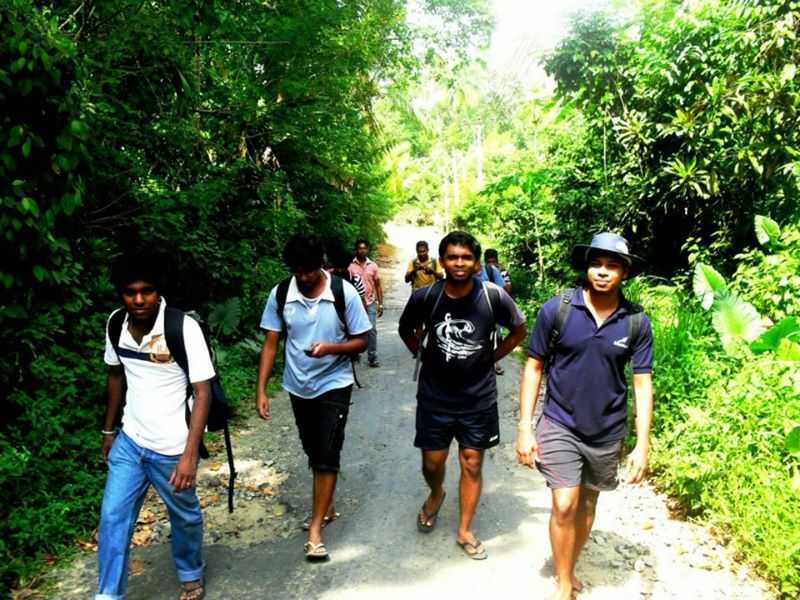 They were with Karandagolle sugatharansi Thero and also willing to visit the cave complex. So we took that opportunity to discuss with Sugatharansi Thero and learn more about the cave. Then we came to back to Meththananda’s place and had a long bath in a near by “Peella”. It was about 5 pm when we had our lunch. Me and another three of my friends had to leave as we had to go back to work in the morning. 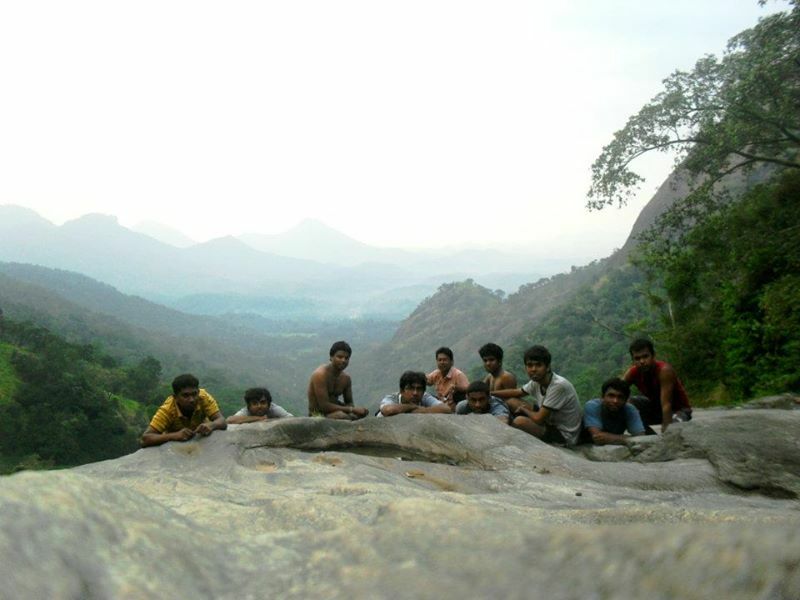 Others had plans to climb “Kurullangala” and then visit Karandagolla temple next day. So we said our goodbyes and came back with the sadness of missing another great hike. 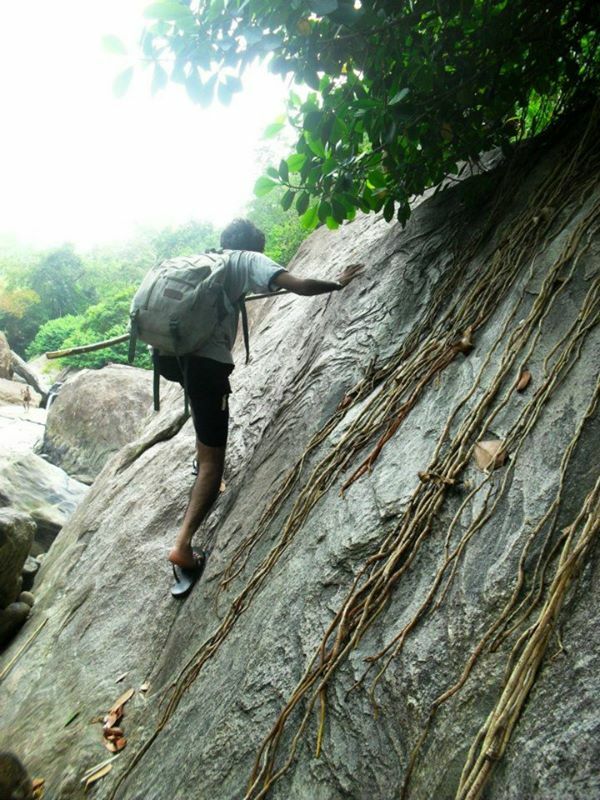 There was a sudden idea to visit and try to climb a waterfall called “Asu Pini Ella”. The only thing we got to know was the location, Aranayake. Some said the name implies “The Waterfall which a horse jumped” but still the origins remain secret. 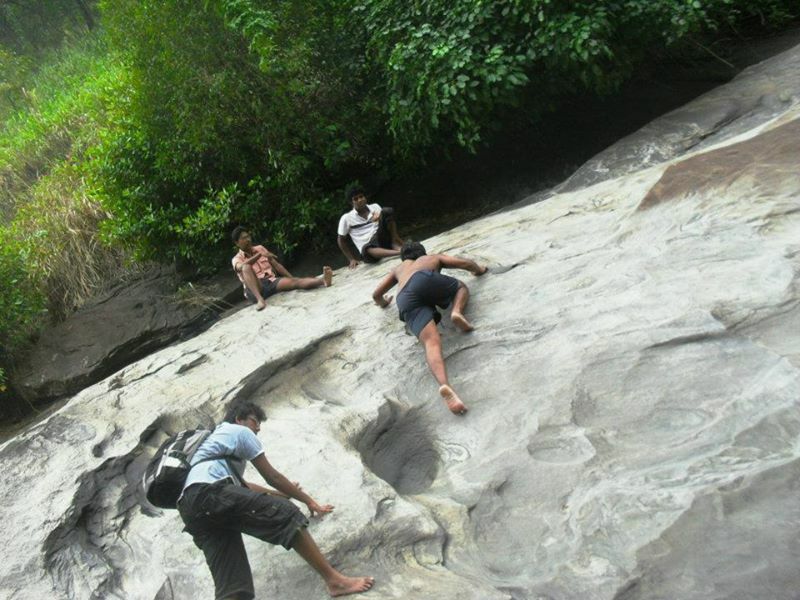 Gladly one of my university friends is from Aranayake, but he too hadn’t climbed it before. We decided to visit it in a weekend. But four of us couldn’t resist barging in to my friends home and spending a night there. So we took a Kandy – Mawanella bus on a Friday afternoon with our friend for the 27 km ride and then went another 13kms by bus to Aranayake. My friend’s father came to the bus halt to pick us up and drove another few kilometers to reach their home. We were greeted by the residents with delicious “Weli Thalapa”, many more snacks and tea. It took only few minutes for us to finish all the snacks and settle in. Soon it became midnight while we were chatting after the Dinner, and forced to sleep as there was a long journey ahead in the morning. The rest of the team (another three friends) arrived to my friend’s home early in the morning traveling all the way from Kandy. If you are planning to arrive Aranayake on the same day morning, it is recommended to find the bus schedule or use a private transportation method. We had the breakfast as soon as possible and departed around 8.30 am. 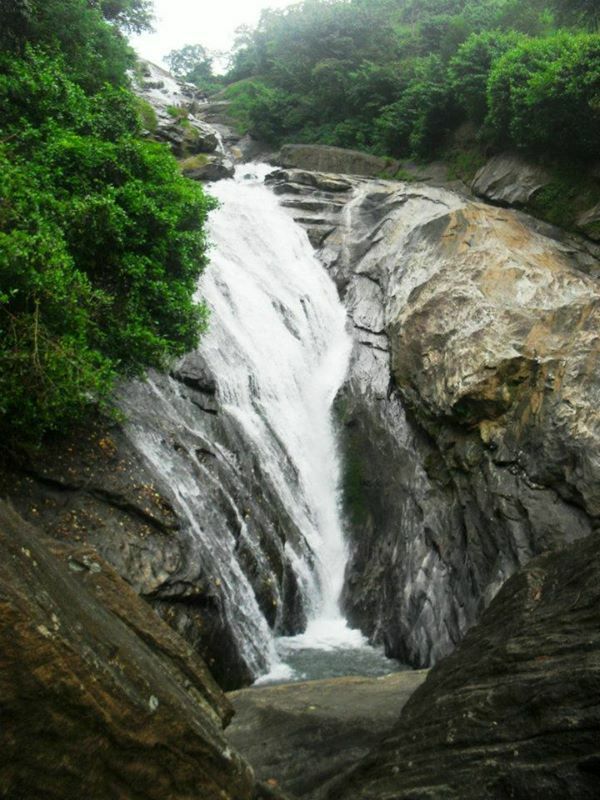 The bottom end of Asu-Pini ella is in Aranayake and the waterfall begins near Dolosbage, Gampola. 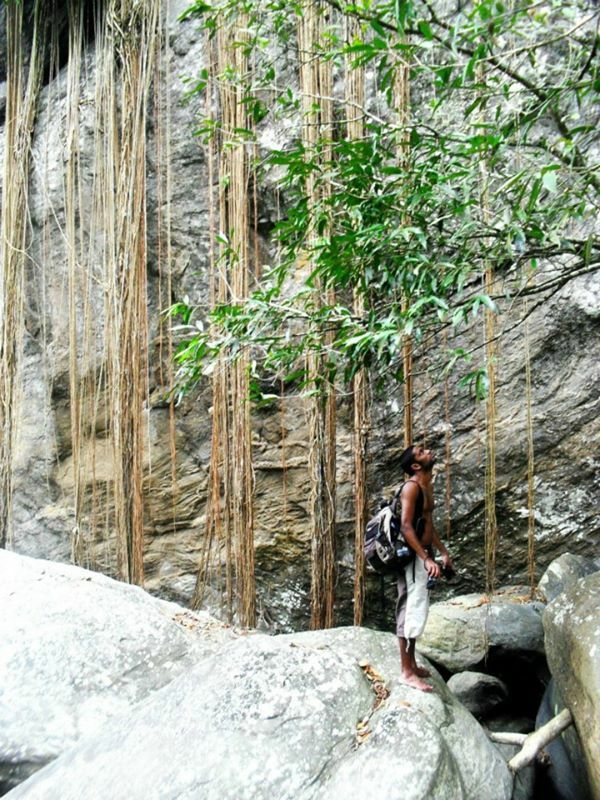 It is said that there is a small road parallel to the water flow from Aranayake to somewhere near the beginning of the waterfall. Also there is an observatory, which we saw on the way. The waterfall height is around 30 meters and we thought of climbing the falls rather than walking on the road to the observatory. 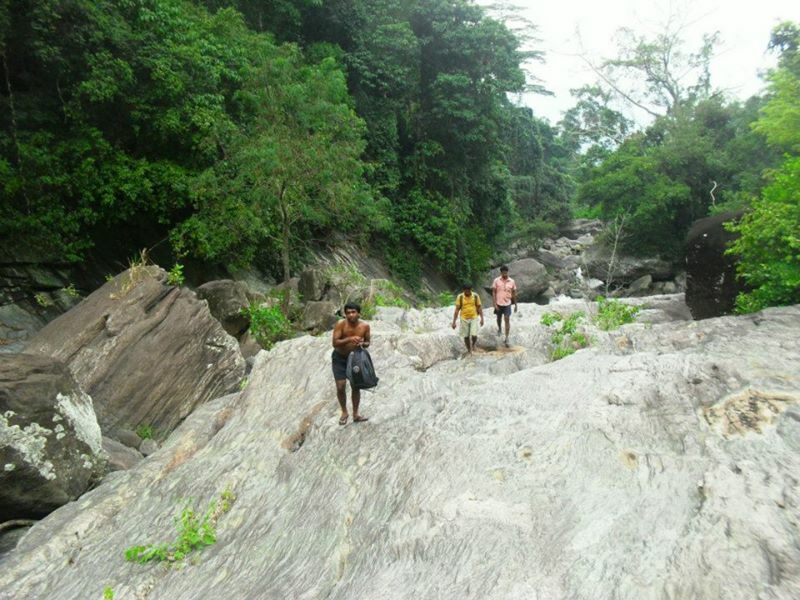 First few kilometers of the road is flat, but then it reduces to a walk-able path through bushes and rocks until the Asu Pini Ella Mini Hydro Plant. The water flow was not that high at the time we went, but there were traces to prove us that water level could rise very high. Most of the rocks immersed from the water had caves and pits which we carefully crossed. There were few places we had to walk in 3 feet high water, even though the water level was low. Since neither of us had waterproof backpacks, our main concern was to keep our belongings dry while crossing the water. 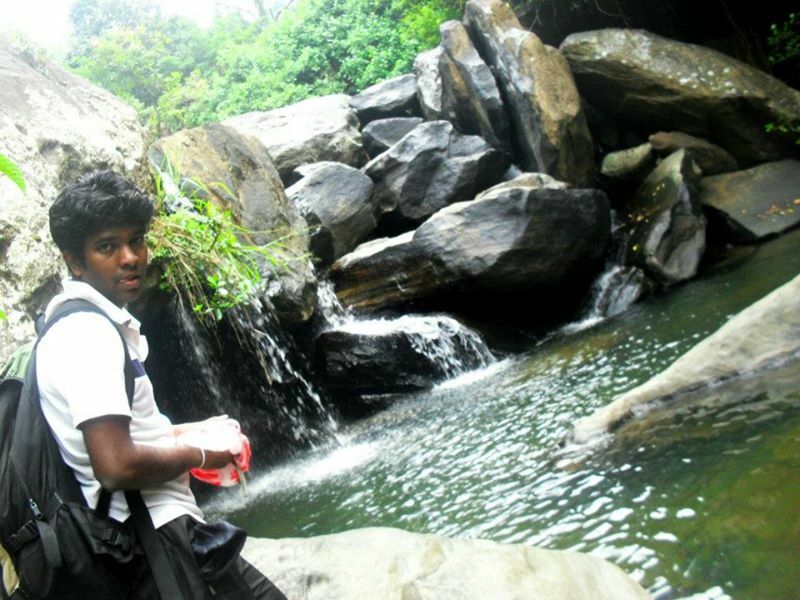 After many kilometers of walk we reached to the bottom of the waterfall “Asu Pini Ella”. There was a large water flow even with the dry climate and we could imagine how beautiful it would be with a full flow. 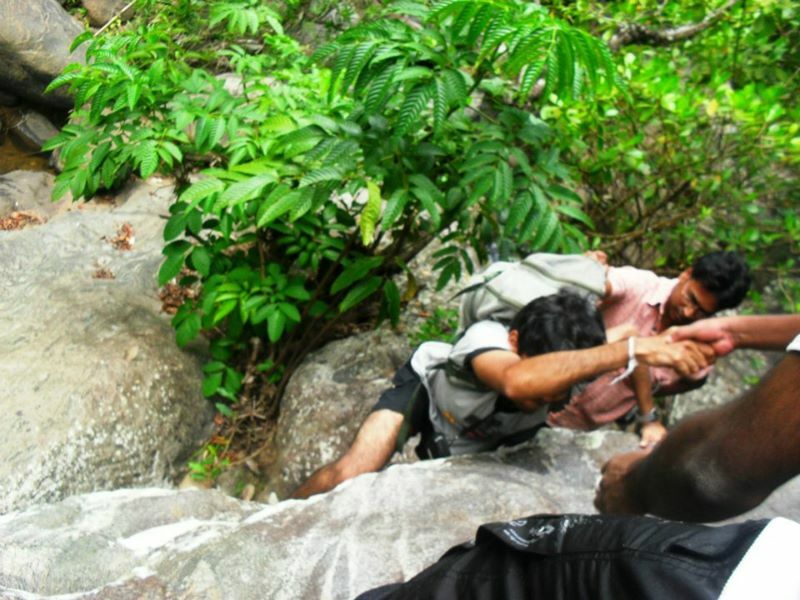 Though we planned to climb along the waterfall, we never expected it to be that steep and dangerous. So we took some time to decide whether are we going to continue or turn back. All agreed to continue, but the risk was very high. It was obvious that we won’t be able to directly climb along the water flow. 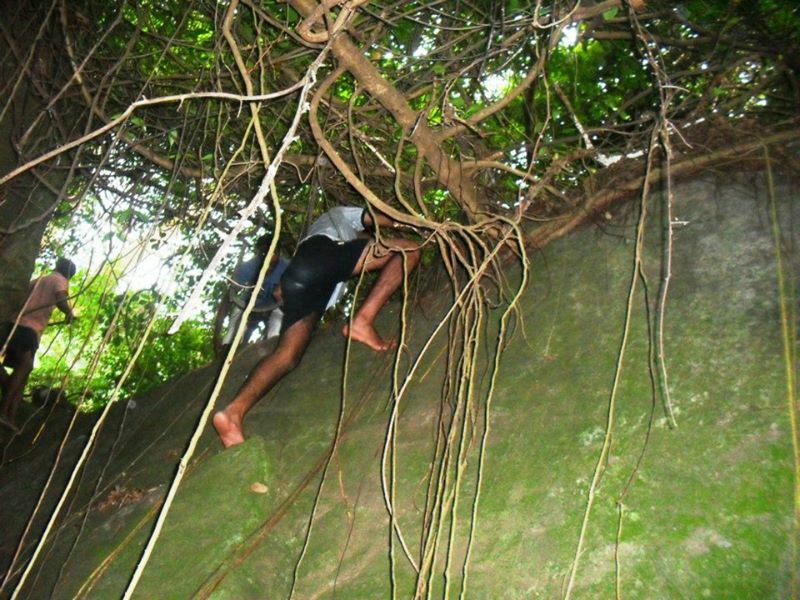 We thought of climbing along the left bank of the waterfall as it seemed less risky. It was around 2 pm, so we quickly ate what we had for lunch on a flat rock surface peeking out from the water. It was hard for us to climb on to the left bank but after getting on it was only a steep climb for few meters. Then suddenly we were facing a large rock with a 90 degree face, around 15 feet in height. 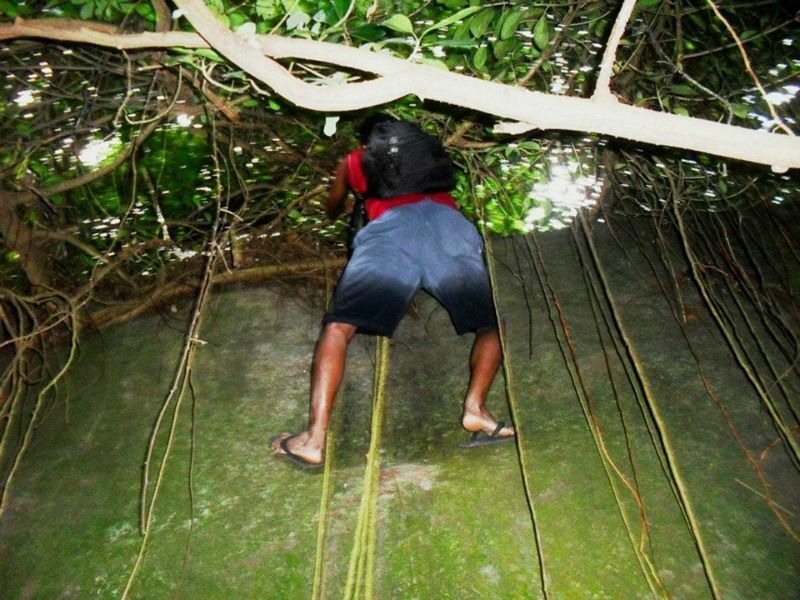 We weren’t prepared for such difficult climb with ropes but luckily there were Mangrove type trees with their thick roots hanging below. We started to climb one by one after assessing the strength of the roots. It was hard to climb with the backpacks, so some threw them over after the first one climbed up. It was difficult but all of us managed to climb up with each others help. Even after that, the climb was steep, where we couldn’t even take our cameras out considering the risk of falling down the hill. But at least the floor was dry and it made the life bit easier. 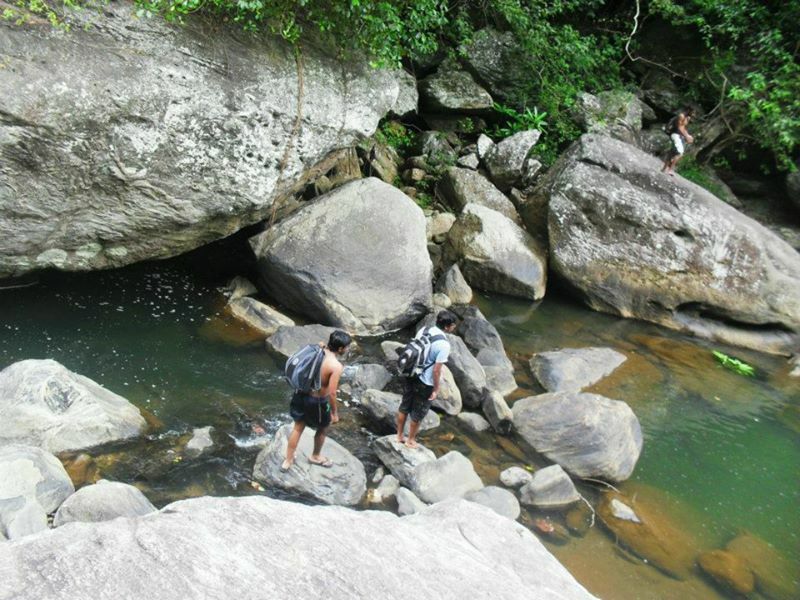 Top most part of the waterfall was a rocky surface with more than 20 feet high banks which we couldn’t climb. 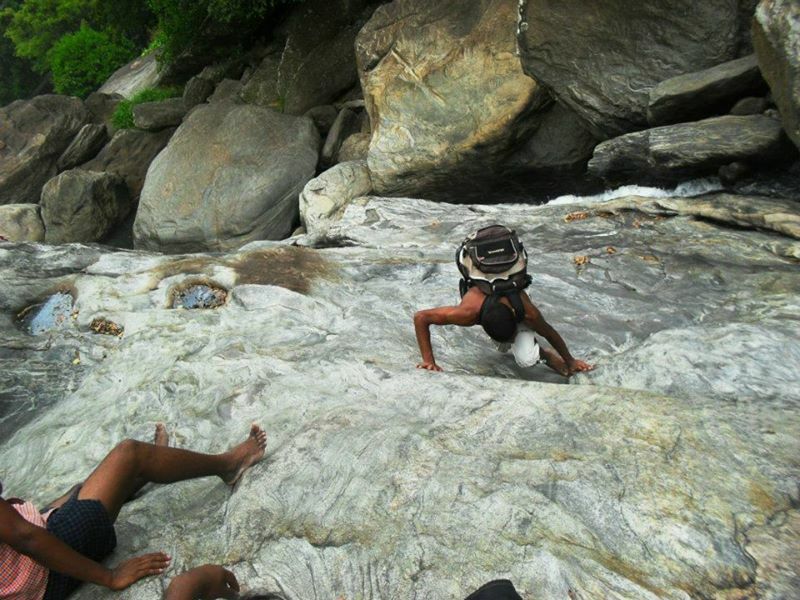 So we decided to crawl over the rock as it will be much difficult to go all the way back to Aranayake. The stone surface was smooth and slippery due to the water flow over many thousand years. Adding another fact to our disadvantages, there was nothing to hang on to while climbing for the most of the parts other than uneven rock surface. No one looked down the waterfall as there was a high probability it will be the last thing we see before our death and luckily able to reach the top without any injuries. 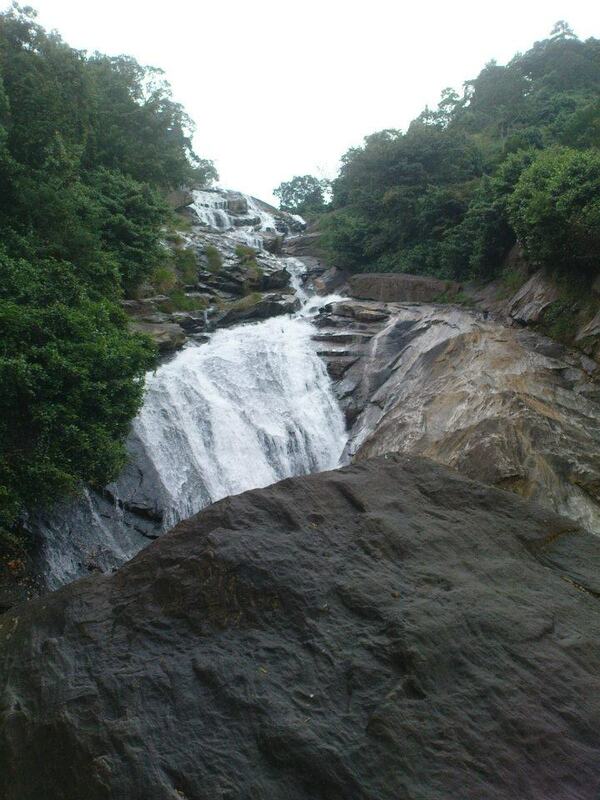 It was a serene view from the top of the waterfall. The whole world seemed stopped other than the continuous water flow on the background sunset. We rested there for about 20 minutes and reached to the natural pool on top around 6 pm. We were exhausted but couldn’t resist a dip in that cold and clear water. 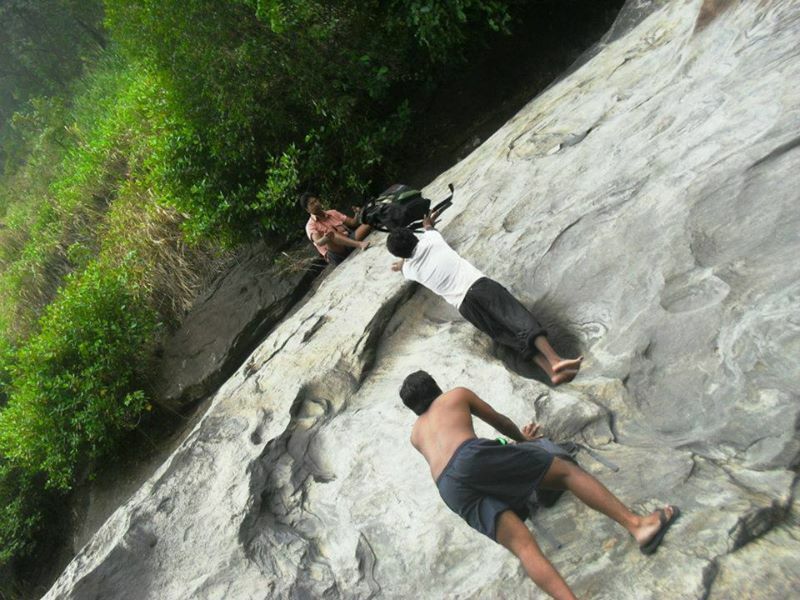 According to the information we got top of the waterfall is Gampola, so we took our time and spent a good half an hour swimming there. Then we inquired a villager about the directions to Gampola town and realized there is another 16 km trip. It was so late that we missed the last bus and couldn’t find even a three wheeler. So we decided to walk again. 😛 Fortunately we saw a van parked nearby a house and was able to convince the owner to rent it. Finally it was 9.30 pm when we reached Gampola Town with the memories of an adventure to cherish forever!